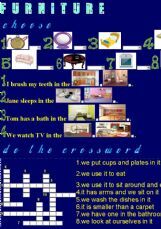 Exercises based on Super Minds 2 - Unit 5: My bedroom. 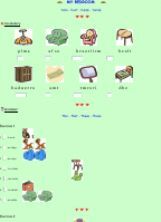 an exercises suitable for very young children as well as adults. 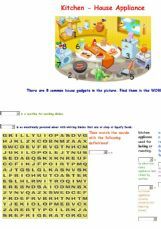 Students must find the names of the objects in the word puzzle. I wanted to add another exercise, but everytime I finished the extra one, the whole page would become messed up. 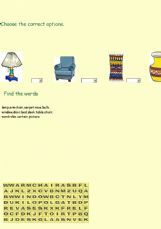 The students have to fill in the blanks with the name of the object in the picture. 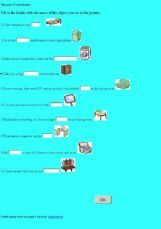 2 exercises where they choose the correct answer and a crossword.Hope it�s useful!! 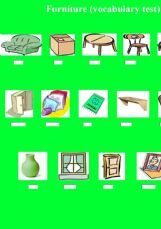 Students revise the furniture vocabulary. And now they�re having an example how to describe their own house. Easy exercise about things in your home.